Posted on November 13, 2017 by Victoria Patti. This week’s episode is a quick one! I’m a member of the California Blacksmith Association and receive the bi-monthly magazine which is expertly put together by Mike Mumford, he does a great job every time. The latest Nov/Dec issue he wrote an article about something he saw in the education tent at the last CBA 2017 Spring Conference. Kevin Lauritsen was demonstrating in the tent and was talking about the difference between right handed and left handed tongs and the reason for the design. I’ve never thought about it and Mike Mumford says he’s never thought about it either, so he went out to his shop and found that most of his tongs are right-handed, but found two bolt tongs that are left-handed. So, I too, went to my shop to see what I owned. I have 6 pairs of right-handed tongs made by Dennis Dusek, a few random tailgate pairs that are right handed and only two that are left-handed. Those two were made and given to me by Uri Hofi and Zeevik Gottlieb. First, some really confusing terminology: The handedness of the tongs refers to the comfortable fit when held in your non-dominant hand. A right-handed person would hold right-handed tongs in their left, non-dominant hand. Right-handed tongs are designed to work best for a right-handed person. Start with the idea that the upper rein is held against the thumb and palm, while the fingers hold the lower rein. The more comfortable way to hold and release is that the lower rein is closer to the body, away from the palm. The lower rein naturally drops away as the fingers are released. 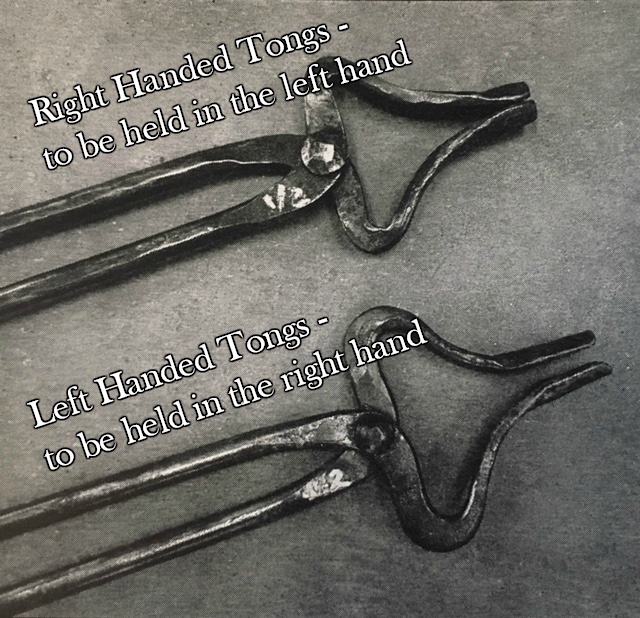 The picture below shows right-handed tongs to be held in the left hand on top. Below them are left-handed tongs to be held in the right hand.